also Requires Art & Craft, Karate, Dance & PET Teachers, Computer Teachers, Computer Operators, Class In-Charges, Accountants and Front Office Executive. 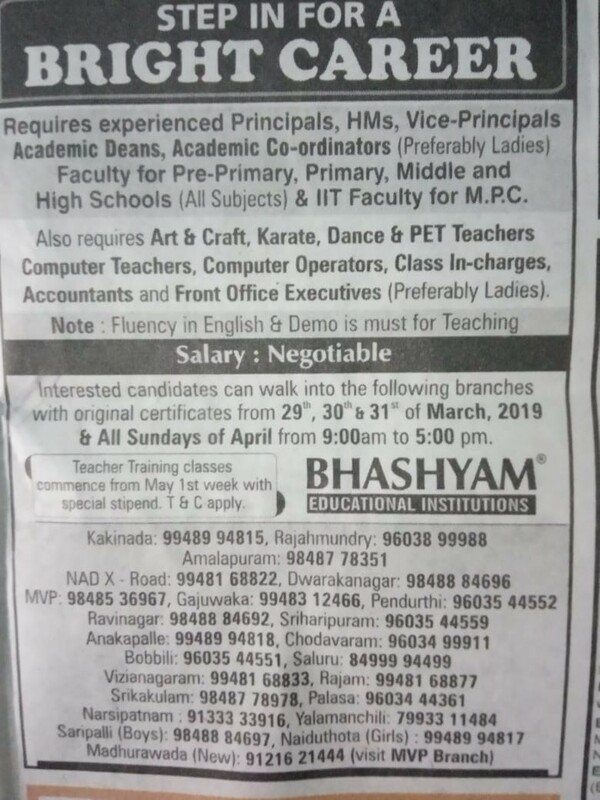 They Prefered Experienced Candidates for Principals, HMS, Vice-Principals Posts and Ladies for Academic Co-ordinators, Front Office Executive Jobs. Fluency in English and Candidates give the Demo for Teaching. Interested Candidates can attend the walk-in Interview dates on 29th,30th,31st, March 2019 and all Sundays of April . Interview Slot at 9: Am to 5: PM. Required Documents are all Original Educational Certificates. Remaining Details are Maintained below. 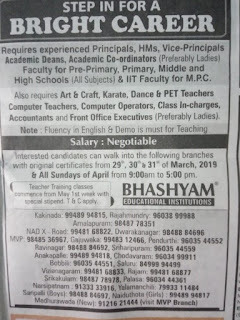 Eligible candidates can attend the interview with all Original Educational Certificates on 29th,30th,31st, March 2019 and all Sundays of April.